on the steam-client 3.0.0.7552 the palms are moving up and down and from left to right for me it looks a bit scary :) It seems if it is windy not only to top of the palms are move but the whole tree. I was at one point a voulenteer to help with C++ coding.. I am sorry it has been very long time since I have been able to login, but I have returned..
Do you still need an extra helping hand / have you all gone full commercial now ? I see you have all gotten into the Valve Corporation as wwell. Congratulations. Launch the ryzom_configuration_rd in your game folder, then check "display" and change to OpenGL or Direct3d. my display is already changed to Direct3D. And I can tell you that happens only in the 3.0.0.7552 client. I didn't have it at the latest 2.1 client. there the palms are not "moving". So it would be fine if there can be found another solution. Mayebe you can try with an other client ? I tried version from latest versions of 2.1, 2.9 and 3.0 clients and the trees and only trees are moving up and down around "1 Meter" in optic. It makes me a little confusing. I have an Lenovo G55 and a Intel mobil grafic card. and also I tried from normal to high all possibilities to change someting by using Directx as mentioned in the forum. Windows 7 I am using. Also installed is the best/latest Intel Graficcard setup for it. Your problem is known and only occurs with D3D, please could you try OpenGL driver instead ? ich hab auch grade einen Kampf das spiel über steam zu starten. ich habe es frisch über steam installiert. und es folgt dieses hier, was ich nicht gant verstehen kann. starte ich die Installation von ryzom aus dem Ordner von steam direkt über die lancher datei, startet es. starte ich es über steam geht es nicht Oo? ich hab aus Testzwecke den Yubo-client mal starten lassen über Steam. der hat gestartet. und ein update runtergeladen. 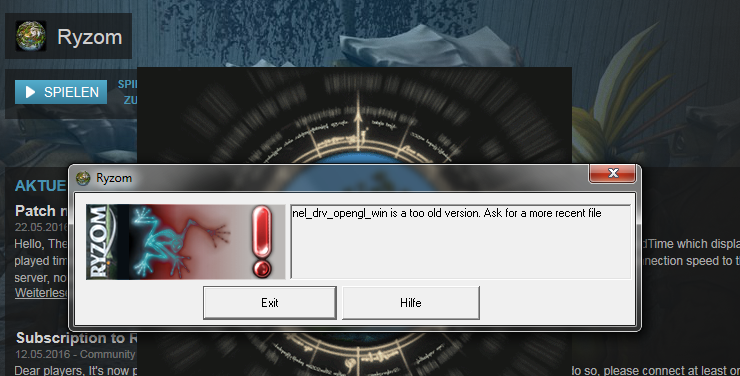 Switching to OpenGL driver solved this problem for me on my Windows 7 64-Bit pc running the 3.0.0.7552 Steam Client!